LOS ANGELES, CA - NOVEMBER 23: Joe Ingles #2 of the Utah Jazz shoots the ball against the Los Angeles Lakers on November 23, 2018 at the STAPLES Center in Los Angeles, California. At some point in his next few games, Joe Ingles will make a 3-pointer that will move him up another notch on the Utah Jazz’s all-time leaderboard. The Aussie has knocked down 536 triples during his time with the Jazz, which currently puts him four back of Bryon Russell (540) for the third most makes in franchise history. In a Q&A with UtahJazz.com, Ingles discussed the meaning of that franchise milestone, Jazz head coach Quin Snyder’s role in developing his game and confidence, and why the guy who has (only half-jokingly) called himself in the best shooter in the NBA doesn’t really consider himself a shooter at all. UTAHJAZZ.COM: What has it meant personally to see your name move up the franchise’s 3-point leaderboard? JOE INGLES: It will probably be one of those things you look back on more when you retire. The thing that does make me kind of proud is just the fact that a few years ago I was in a position where nobody really wanted me in the league except these guys, and the belief they had in me my first couple of years when I didn’t really know what I was doing, if I fit in, or if I should even be playing in the NBA. I’ve seen the list come up a few times more recently because I’ve passed a couple of guys. But I’ve never gone into my career thinking I was going to beat a record. But it would be something I would be proud of when I retire. I think Gordon [Hayward] and John [Stockton] are on the list. UTAHJAZZ.COM: At your current pace, you would need about 70 games to pass Hayward and 150 games to pass Stockton. INGLES: Gordon spending eight or nine years here and John spending 20 years or whatever. Obviously, it was a different style of play back then. But any time your name would be close to John or Karl Malone, that would be something special. UTAHJAZZ.COM: You shot 35 percent from 3 during your first season here. The last two seasons, you have shot nearly 45 percent. What has changed for you? INGLES: I used to catch and take a big dip down and then finally I’d try to shoot. That first year playing the NBA, I was realizing how little time you have to shoot the ball. The time you have from when you catch it to the guy closing out is just a split second. So I had to figure out a way to get my shot off quicker. Then it was just repetition. The number of coaches we have here, you’re able to work on your individual game In Europe or the national team, you’ve got three coaches for 12-15 guys. You’re always shooting with 3-4 other players. You’re not getting your own reps. Here I’m able to take 200 shots, 500 shots. Whatever I’m feeling. UTAHJAZZ.COM: Who helped you tweak your shot? INGLES: It was Quin [Snyder] and [assistant coach] Zach Guthrie. I think I knew it myself, too. Then it was just a matter of getting comfortable enough to shoot it in the game. Catching it high, ready to shoot and not what I’d done for 26 years of my life. It takes a little while to be confident to do that in a game. Now I feel super comfortable. I feel like when I shoot it, it’s going to go in every time. UTAHJAZZ.COM: How important has that confidence been for your development and your increased role? INGLES: A very, very, very big part of it is that. That’s thanks to the curly-headed coach that we’ve got. I’d never really had a coach that believed in me or at least given me that much confidence. If he told me I could run through a brick wall, I’d feel like I could do it. Whatever he says or puts in front of me, I feel like I could do it because I don’t feel like he would lie to me. UTAHJAZZ.COM: Did you make a concerted effort to pick up your scoring after Hayward left in free agency? INGLES: Not even when Gordon left, more when Rodney got traded. 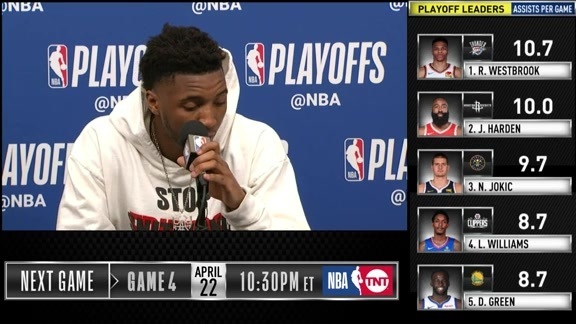 We’d already lost Gordon and Hoodie was going to be our guy, and then we had Donovan, and I was kind of in the middle. I had a few plays here and there. But once Hoodie was gone, it opened up even more for me. From that All-Star break on, I had to be more aggressive, there were more plays coming my way and I was just trying to take advantage of it. It wasn’t like Quin sat down and said, ‘You need to take 10, 20 shots a game.’ He just told me to be aggressive and I feel like it’s worked out all right. 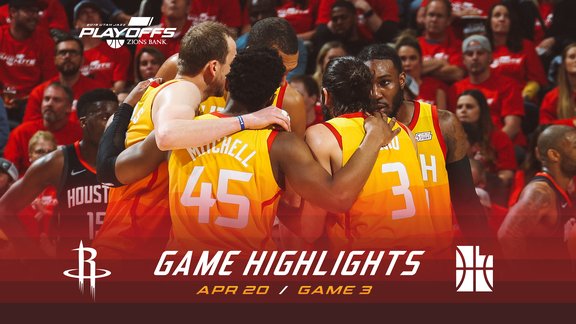 UTAHJAZZ.COM: You seem to get a lot of open looks from 3 (only Houston’s Eric Gordon had more wide-open 3-point attempts than Ingles 297, according to NBA.com) considering your shooting percentages. Do you see that on film? Why is that? INGLES: I do feel like I get a lot of open shots. Although the last week or 10 days, teams have really been top-blocking me and really not letting me touch the ball, which is something I have to get used to. Last game against the Spurs, we ran some different stuff to get me moving. But I feel like the looks that I get are because of the way we play and our team. We’ve got a point guard who is super unselfish. Our young little superstar is aggressive offensively but from November last year to now, his passing is unbelievable compared to what it was. Rudy and Fav are rolling, opening things up. Teams don’t want those guys to do dunk it. And I’ve always kind of been that forgotten guy. When we had Gordon, it was Gordon and Rodney [Hood] and I’d stand in the corner and defenses would over-help. I don’t think it’s intentional by other teams. You just have to leave something open and I think I’m on the end of a lot of that stuff. 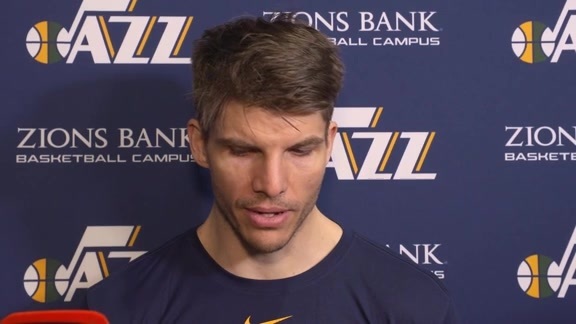 UTAHJAZZ.COM: You haven’t played together much, but do you envision sharing the court more with Kyle Korver? INGLES: I do. Right now, the rotations are a little different at the moment. We cross over for a couple of minutes maybe. But if it’s me and him and Ricky, or me and him and Donovan, I think that gives even more spacing. Ricky will be able to play pick-and-roll with Rudy. They’re not going to want to leave me and Kyle. It becomes pretty dangerous. We’re obviously still figuring it out with Kyle getting into the system. I think once we get it down and get our flow, me and him together will be really good. UTAHJAZZ.COM: You’ve called yourself the best shooter in the league. Did you always consider yourself a shooter? INGLES: No, and I still don’t really. Kyle Korver, to me, is a shooter. JJ Redick is a shooter. Ekpe said it last night during the game that Kyle is one of the purest shooters he’s ever played with. I looked at him and said, ‘What about me?’ but I was joking. My first reaction is to get downhill and try to create for my teammates. I’m only going to shoot when I get a good open look. Some of the shots Kyle takes would be a really bad shot for anyone else. I only consider myself a shooter in certain situations.